Do you have a video interview on your agenda? 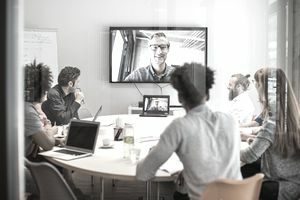 As hiring becomes global and more employees work remotely, video interviews have become commonplace. For hiring managers and recruiters, they're a way to quickly conduct first-round interviews, save on transportation costs, and get the interview process started much faster than scheduling in-person interviews. The key to a successful video interview is to practice beforehand so that you avoid technical problems and feel confident with the process. Review the following tips to make sure you ace this type of interview. Keep in mind; a video interview carries as much weight as an interview conducted in-person, so you will want to make sure that you're well prepared to interview remotely. For an interview in the company office, arrive early, so you have time to get situated. Ask for assistance if you're not sure how to use the equipment. Even if you think you can figure it out, it's good to ask for a quick overview. If you are using your own equipment, do a trial run a day or two before the interview. Set up your camera and any headset or microphone as if you were going to do the actual interview. If possible, use the same video technology that you'll be using during the actual interview. That way, you won't have any last minute installation issues or password problems right before your interview. Your camera should be at eye level (not above or below). A poorly placed camera can result in unflattering double chins or weird shadows. Check to make sure your sound equipment works properly. Regardless of location, make sure that you send any materials (resume, portfolio, etc.) that the recruiter needs in advance. During your test run, take a look at the background that shows up in the video. Does it look cluttered or distracting? Plan to have your background be tidy. A plain wall is ideal, or an office-like setting. Pay attention to the lighting, too. You do not want to have lights sources behind you since that will leave your face in the shadows. On the day of the interview, dress professionally, wearing the same interview attire you would for an in-person interview. While the camera angle should show you from the waist up (your face is the real focal point) if there is any possibility you will need to stand up, make sure your pants or skirt is professional. Make sure the table and your surroundings are clean and neat. You don't want to distract the interviewer. If you're interviewing in your home, make sure that you are in a quiet space with no barking dogs, children, music, or other sounds. As well, turn off your phone and any alerts on your computer to avoid getting thrown off by emails or instant messages during the interview. The microphone will pick up any noise in the room, so don't tap your pen or shuffle papers. Make eye contact, and remember, that means looking at the camera (and not the picture-in-picture image of yourself). Use the same good posture you would use during an in-person interview. Avoid making a lot of hand gestures—even with a great Internet connection, there can be lag time, and hand gestures can stutter on the screen. The company selects candidates for video interviews. Arrangements for an interview are scheduled - at home with your own webcam, a company office, an off-site location with a webcam setup, or via a webcam sent to the applicant. A tutorial will provide instructions on the webcam and the interview. There will be 10 - 15 questions related to the job the company is hiring for. The applicant will have 30 seconds to read the question and two minutes to respond. Other than you're not meeting the interview in-person, the interview process will be the same as an in-person interview. The interviewer's objective (to screen candidates for employment) is the same. You will be asked the same type of interview questions. Also, be prepared to ask questions, as well. If you're not sure about how the interview is proceeding, it's fine to ask the interviewer how you are doing. What's most important is to consider this type of interview is just as important as if you were meeting the interviewer in his or her office. The value, for yourself as well as for the hiring manager, is equivalent, and interviewing successfully, however it takes place, is the key to getting hired. What do employers want to see when they review videos from candidates for employment? Answer the questions asked, not the questions you wish were asked. Recruiters and hiring managers want to know you can do the job required, so they ask specific questions. A video is a faster way for them to screen seekers than traditional applications, so don't give them a reason to delete yours. Show creativity. In your responses, relate an experience that demonstrates how you can perform the job required. If you are applying to be a chef, for example, record your answers in the kitchen while you're preparing a dish. Be presentable. Make sure you are dressed and groomed appropriately and practice your answers, so you have the best representation of yourself as possible. Videos are a great way to stand out from the other applicants who have only their paper applications or online text resumes. The best videos get forwarded and replayed many times.